1. Caption for the book review - this goes before the body of the review and is the headline for it - use a few words to describe your particular feeling/reaction to the book. For example: inspirational read, a page turner thriller, not to be missed sweet romance. 2. Then in the body of the review you state what you liked or not. What interested you the most about the book, and would you recommend it. I would very briefly summarize the story of the book, if it is a fiction book. Do not go into too much detail, just the basics. Anything that stood out from the story is what needs to be put in the book review. For non-fiction, point out a few key things that you liked. You can incorporate a brief quote from the book in the review too. 3. You can add the qualities of the auhor's writing that you liked best: i.e. : descriptive, suspenseful, true to life, etc. 4. Make sure to select the number of stars you would give the book. 5. 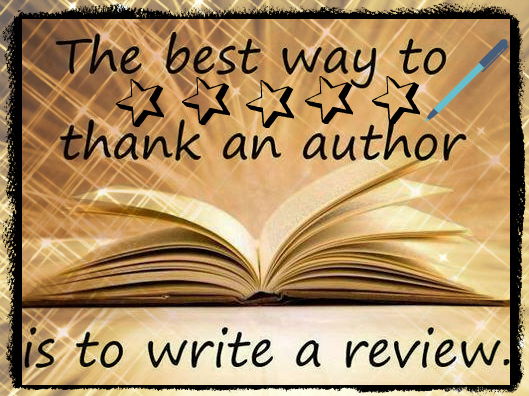 Let the author know you have posted a review for their book, so they can promote that on their social media, and thank you for doing it. A book review is a simple process that should not take more than 10 minutes to write. Consider doing a book review(s) for your favorite authors. They will be very thankful. What is it about writing a book review that stops you from writing one?